This is a list of notable bartenders. 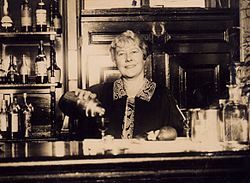 A bartender (also known as a barkeep, barman, barmaid, or a mixologist) is a person who serves alcoholic beverages and other drinks behind a bar, typically in a licensed establishment. ^ Regan, Gary (August 15, 2010). "Here's to the genius who created the Treacle". San Francisco Chronicle. Retrieved 19 October 2013. ^ Brunton, John (October 30, 2010). "Making cocktails at the Paris Ritz". Financial Times. Retrieved 19 October 2013.